Since losing her eyesight due to an undiagnosed optic nerve atrophy, choreographer and performer Mana Hashimoto has dedicated her life's work to exploring how the body exists in space with or without sight. Trained in ballet, jazz and Graham technique, she has performed all over the world, from her native home in Japan to New York City's Metropolitan Museum of Art and Jacob's Pillow. Hashimoto is also the founder of Dance without Sight, a series of workshops designed to discover movement through touch, sound and smell. Dance Magazine recently say down with Hashimoto to learn more about her process, and what it's like to be a bridge between the seen and unseen worlds. "I was able to see until my 20s. I have seen classic ballets, performing arts, pictures and paintings. It's in my physical memory." "A challenge now is where can I get new information. I go to shows with close friends and ask them to describe what they see or show me through movement." "I get ideas through everyday life. I listen to YouTube and get inspiration through people I meet, books I read. I am inspired by Helen Keller, goze (groups of blind female musicians), and Japanese female writers Sei Sh¯onagon, Murasaki Shikibu and Ichiy¯o Higuchi." "I constantly question what it means to be a blind, Asian female dancer experiencing the world right now." "Bridge over Troubled Water, performed at the Metropolitan Museum of Art last May, is a collaboration with the Lighthouse Guild Vocal Ensemble, a visually impaired choir. Before the performance, I showed them my movement by describing what I was doing and having them feel my body with their hands." "I believe dance comes from my soul. I am presenting my soul. I have to make it convincing for those who can see. I invite close friends and family members to rehearsals for feedback to help make sure my work makes sense." 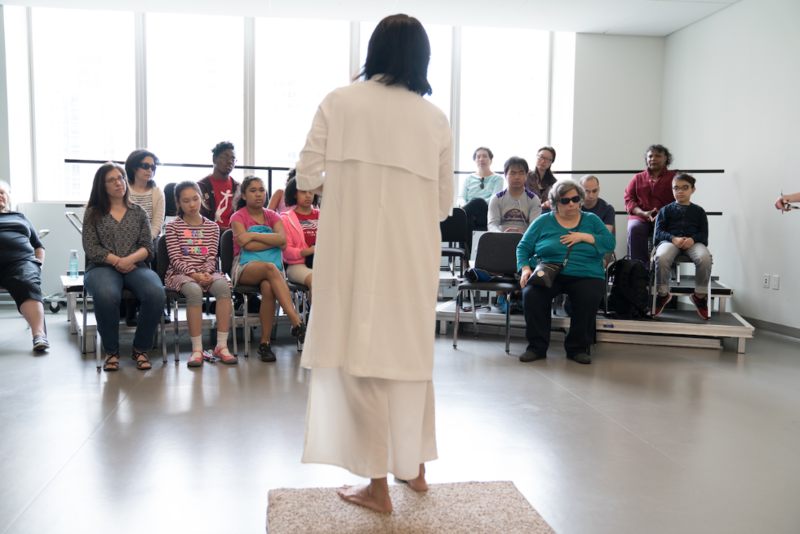 Hashimoto's Dances Without Sight workshops are designed to share movement through other senses. Photo by Julieta Cervantes, courtesy Hashimoto. "My performances include a seating area for audio descriptions where people describe the work. It's difficult to say everything, so I work with the speaker to make a balance between the abstract images and technical parts of the dance." "Before the performance, I also invite visually impaired audiences on a touching tour where they can feel the costumes, walk on the stage, make sound and feel my body move." "Dance is a visual art. It is difficult for visually impaired individuals to enjoy dance as an art form, not only as therapy. We need accessibility and sight assistance through touch to take classes. I teach workshops throughout the year. I would love to work with university dance departments to start a program to introduce movement for visually impaired dancers. They are our next generation of educators."